That's right! Starting today, if you buy $65 or more in physical product on Warehouse 23 you receive free FedEx domestic shipping. Not valid on international orders. Sorry, guys. This deal ends on our final shipping day of 2015, December 18! So if you're looking for the perfect gifts for the munchkins in your life, there's no better time than the "present" (see what I did there?). Pop over to Warehouse 23 to peruse the plethora of products we purvey! The order must be shipped within the continental U.S., and this excludes APOs/FPOs and P.O. Boxes. Just choose the default shipping method at checkout to qualify. It's the one with $0.00! More shipping details are on Warehouse 23. 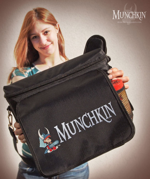 Have you been on the fence about picking up a Munchkin Messenger Bag? Well, come down from your fence and open the gate, because for a limited time it comes with a ton of extra goodies! The Munchkin Messenger Bag normally comes with a couple of promo cards and a unique Jumbo D6, but from now through Friday, December 18, when you purchase a Munchkin Messenger Bag at regular price, we'll throw in lots and lots more swag -- more than $30 of assorted dice and cards and boosters and bookmarks and . . . who knows what else!